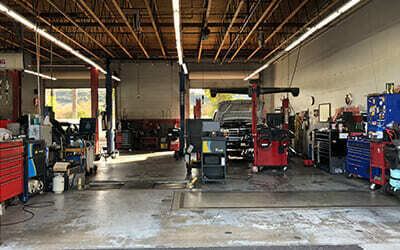 Poway’s Precision Automotive is a 3200 square foot facility located in east Poway close to Garden Road, and shares a parking lot with Quality Recycling. It is right off of Poway Road and Adah Lane. 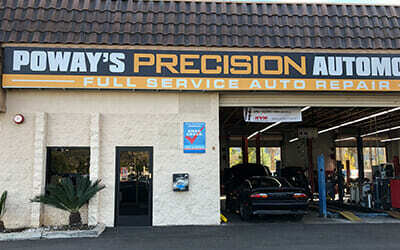 Precision Automotive started out as a precision tune franchise over 30 years ago, then was converted to an independent shop and became “Poway’s Precision Automotive” in 2011, and has kept the same name ever since. Eric has been our all-star service advisor for the past four years. He holds certifications as an ASE automotive service consultant and has ten years experience as a Japanese vehicle technician and thirteen years experience as a service consultant. He is passionate about his job and being the liaison between the client and the technician. He believes in being a clear communicator and keeping people safe on the road. He enjoys spending his days off with his family, including his wife and two sons. He loves every second he gets to spend with them! Mike is a hard-working professional, specializing in heavy line engine repairs. He has been in the industry for the past fifteen years. He enjoys welding and metal fabrication in his spare time, as well as spending time with his two young daughters. He one day hopes to branch out on his own and start his own business. Ernesto has been with us for two years, he is a heavy-line specialist including engine and transmission rebuilding. He learned how to work on cars from his dad who is currently a transmission builder. He has been working on cars since he was ten years old and has been a professional in the industry for the past ten years. When he’s not working you can find him spending time with family or drag racing his sand truck. One day he hopes to own his own business in the auto repair industry. Matt has been with the company for the past seven years and is currently our lead technician. He is a talented technician and can diagnose and troubleshoot almost anything. He is a true craftsman and cares about putting out the highest quality possible. Matt holds multiple certifications in brakes, transmissions, electrical systems, and engine performance. He enjoys spending time with his kids during his free time as well as hiking. He intends to expand his expertise on electric vehicles and transmission rebuilding.